All the fun of the races without the horrible whips! 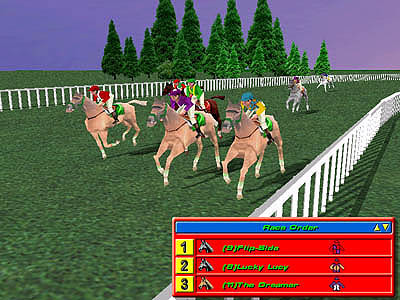 You and your pals have got $1,000 dollars each and head out to the local race course to try and double your money!Using your skill and judgement, study the facts about the horses and jockeys and place your bets! You can have up to 5 players on the same machine with the winner being the one who, at the end of the day, has the most money left. ses are rated by their speed and stamina. Jockeys are rated by their ability. Races are run over a variety of lengths.